Calling all the Shadowhunters that speak German! Every year German readers nominate and vote for their favorite books and this time two of Cassandra Clare’s novels are nominated and one may win the German ‘Leserpreis’. The ‘Leserpreis’ was first awarded in 2009 and isn’t dependent on sales, but on which book you liked best. 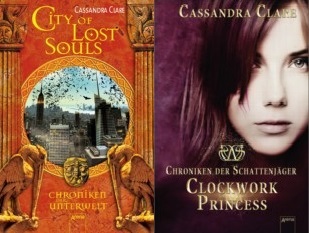 City of Lost Souls and Clockwork Princess are both nominated in the category ‘Jugendbuch’ (Young Adult novel) and you can vote for one of them here. Voting is open until November 28 (11:59 pm, UTC+1) and the winner will be announced on November 29. The German colours look awful!